The Mercedes maker recorded its best ever quarter for sales and operating profit. With profit margins rising and a cash pile of 20 bln euros, it’s time to re-engineer the payout policy. BMW, which is mulling a special dividend in 2016, can again serve as a role model. Daimler CEO Dieter Zetsche poses for media before the Daimler annual shareholder meeting in Berlin April 1, 2015. Daimler’s operating profit rose 41 percent to 2.93 billion euros in the first quarter, the German carmaker reported on April 28, ahead of the 2.65 billion euros forecast in a Reuters poll. Shares rose 1.9 percent to 91.23 euros in morning trading. Record deliveries last month in Europe, China and the United States drove up quarterly passenger car sales to 459,708 models, exceeding last year’s high by 18 percent, the Stuttgart-based group said. Return on sales from ongoing business at Mercedes-Benz Cars came in at 9.2 percent, up from 7 percent a year ago. 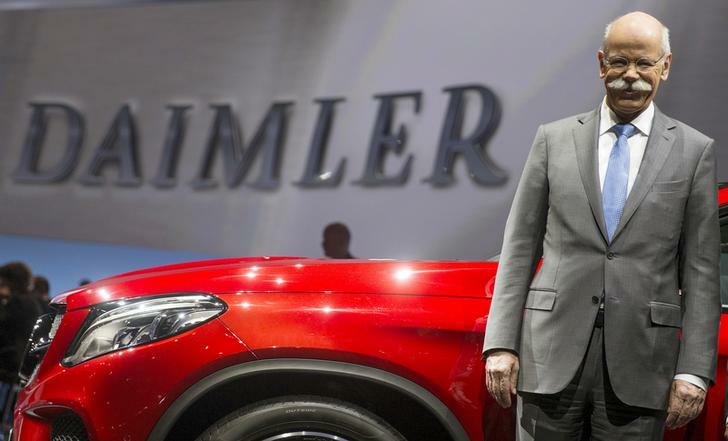 Daimler reiterated it expects significant growth in revenue, EBIT and unit sales from ongoing business this year. Finance chief Bodo Uebber expects that foreign exchange-rate tailwinds will be worth up to about 1 billion euros this year.